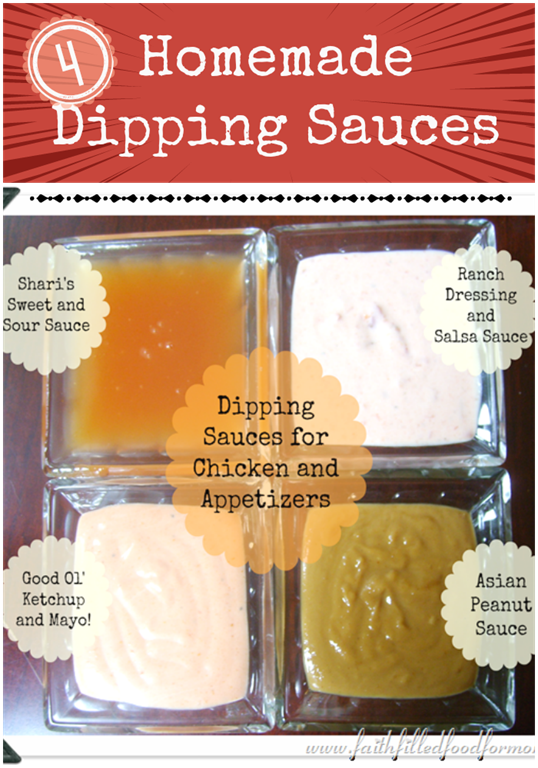 My family loves simple Homemade Dipping Sauces for Chicken, Chips, Appetizers and Pizza! Can we just eat something plain please!? Nope. I try to be creative in my cooking, because eating and cooking can get a bit boring. This is just one simple way to add a little pizzazz into an everyday food, it keeps them coming back for more! This is also a great way to serve your company simple Appetizers then let them choose the flavor they want to add to their foods. This is an original…from me! Enjoy! With the holiday season upon us, it’s a great time to try out some of these Dipping Sauces to see which one you and your company might like the best! Hi Shari, these recipes are great to have handy for the kids to dip their veggies and chicken in. I like to mix ranch and pesto…the kids love it. Hope you can come and share on the Merry Monday Link Party too. These are great. I never knew sauces could be so simple to make. These would make a cute christmas gift if you put them in small jars. Pinning! These all look delicious (even the ketchup and mayo!) My hubby would LOVE the Asian Peanut Sauce. Pinned for later! Thank you for sharing with us at Merry Monday! Very handy to have around!! I am a lover of bite size food, especially when I can dip!! Thanks for sharing!! I love making homemade dipping sauces, they just taste so much better. Pinned it. Found your blog on Mom’s Library link party and started following on Pinterest. Sweet & sour dippig Sauce .. Amount of cornstarch, PLEASE..
1 1/8 tsp. Cat, thank you for bringing that to my attention 😀 Have a blessed day! Thank you, Shari .. that is what I guessed at. Also, thank you for your speedy reply. Blessings!!! These looks wonderful. What a fun mom to make the ordinary a little more exciting. I can’t wait to try the Sweet & Sour. Thanks for sharing with us at Simple Lives Thursday; hope to see you again this week.